From Baeseman’s Shoes and Clothing’s start as a small surplus store in the 30s, to a popular shoe store in the 60s, the new millennium has brought many improvements and additions to the Baeseman twins’ dream. Every year we expand a little more and fill the shelves a little higher. Here in Central Wisconsin, we have eight months of cold weather, so we have learned not to put too much stock in selling bathing suits, but rather into durable, warm and dry clothing and footwear. In fact, we regularly outfit groups of hunters heading up north for the big deer hunt as well as hunters heading out west for that trophy mount. years. It’s layers, layers, and more layers. No secret there…but sometimes we think new technology trumps Grandpa’s old-time experience. We start with Minus 33, 100% merino wool as a base layer. Wisconsin-made Wigwam socks are made with merino wool. They are a staple for keeping your feet warm and dry, and we always try to keep a large selection on hand. Wool clothing has been a cold weather standard for centuries and has always been a top performer for Baeseman’s Shoes and Clothing. 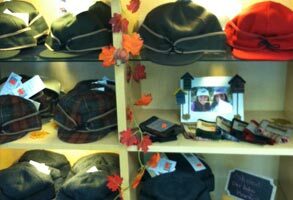 We feature a large selection of wool jackets, Codet wool bibs and pants, Pendleton wool shirts, Bemidji blankets, socks, long underwear, hats, caps, and gloves. And for the outdoorsman who has everything, we offer fur mountain man hats made from raccoon, coyote, fox, and the occasional skunk. 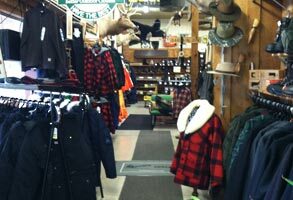 Stop in and see our wide selection of outdoor clothing. You’ll be glad you did.